Jonny White’s Art Department returns this March with his first solo EP in nearly 3 years, the first of a string of releases planned for 2018. The record features three inventive new tracks, including one produced in association with New York house pioneer Toddy Terry and vocalist Roland Clark. In no uncertain terms, this package re-asserts Art Department as one of contemporary house music’s most essential voices. White has continued to build on the early success of Art Department with solo works and high-profile collaborations in recent years. 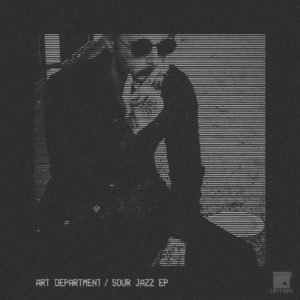 It is an alias that transcends genre, infused with elements of dub, acid, house and techno and is well informed by the past whilst always striding into future and unknown musical territory. This new release does this once more with three standout productions that are a further bold statement of intent. First is ‘Sour Jazz’, a cut which intimately shows off White’s originality in the studio, delivering a sublime production rooted in driving, weighty drums and twisted bass. Up top, pained synths bring a sense of real emotion to the groove and as things unfold, keys run down the face of the arrange- ment. Clever breakdowns build the tension and the palpable heat, sweat and intensely of being lost in a packed dancefloor oozes out of the track, flooding you with feeling. The brilliantly bristling ‘721 (Queen St)’ shows off White’s ability to programme an essential and absorbing drum line: it is bouncy and big, elastic and lively, and cannot fail to get under your skin thanks to its instantly classic sound and old school flavour. The physical nature of those drums are offset with deft chords which dance up top and bring light to the track, while sax lines gently drift in and out for extra musical flavour. And so to ‘Roots Deep’, a collaboration that spans the decades, back to the roots of house music with Todd Terry and Roland Clark. Reminiscent of earlier Art Department records with unforgettable hooks tied down with tough percussion, it is an immediately timeless anthem done as only this man can. Waves of synth and echoing vocal stabs set the stage, but it’s when the famous ‘in the beginning’ vocal starts that hands will go skyward and the club will erupt. It brings a near religious edge and gospel feel to the track, whilst a standout bassline tumbles down the scales to finish things in robust style. Once again here, Art Department combines a true understanding of dance-floor dynamics and house history with a unique sense of vision that ensures this is an EP packed with vital and inventive new sounds.